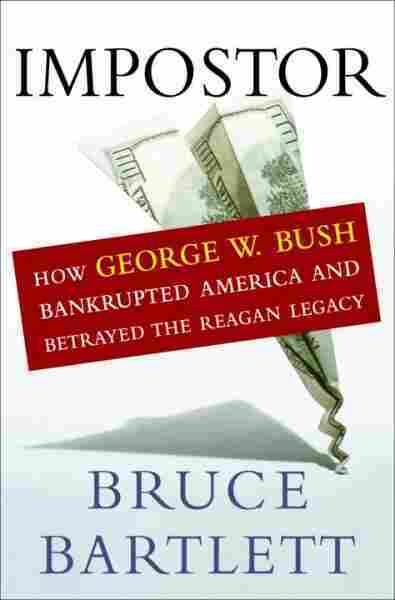 Impostor NPR coverage of Impostor: How George W. Bush Bankrupted America And Betrayed the Reagan Legacy by Bruce Bartlett. News, author interviews, critics' picks and more. Reviews the economic policies of the Bush Administration and explains why tax cuts combined with increased spending and politically-motivated trade policies have created large federal deficits and jeopardized the country's economic future. George W. Bush is widely considered to be one of the most politically conservative presidents in history. His invasion of Iraq, his huge tax cuts, and his intervention in the Terri Schiavo case are among the issues where those on the left view him as being to the right of Attila the Hun. But those on the right have a different perspective–mostly discussed among themselves or in forums that fly below the major media’s radar. They know that Bush has never really been one of them the way Ronald Reagan was. Bush is more like Richard Nixon–a man who used the right to pursue his agenda, but was never really part of it. In short, he is an impostor, a pretend conservative. Traditional conservatives view the federal government as being untrustworthy and undependable. They utilize it only for those necessary functions like national defense that by their nature cannot be provided at the state and local level or privately. The idea that government could ever be used actively to promote their goals in some positive sense is a contradiction in terms to them. It smacks too much of saying that the ends justify the means, which conservatives have condemned since at least the French Revolution. George W. Bush, by contrast, often looks first to government to solve societal problems without even considering other options. Said Bush in 2003, “We have a responsibility that when somebody hurts, government has got to move.”(6) A more succinct description of liberalism would be hard to find. In White Houses filled with high-caliber people, dissent invariably arises and becomes known. The apparent lack of dissent in this White House, therefore, is an indication to me of something troubling–an unwillingness to question policies even behind closed doors, an anti-intellectual distrust of facts and analysis, and blind acceptance of whatever decisions have been made by the boss. The only alternative is something equally bad–fear of telling Bush something he doesn’t want to hear. When asked whether he ever disagreed with him, Mark McKinnon, Bush’s chief campaign media adviser in 2004, said, “I prefer for others to go into the propeller first.”(12) This is the sort of thing that has gotten many big corporations like Enron in trouble in recent years, and I fear similar results from some of Bush’s ill-considered policies, especially the disastrous unfunded expansion of Medicare. In thinking about Bush, I keep coming back to Ronald Reagan. Although derided as an amiable dunce by his enemies, it is clear from recent research that his knowledge and intellect were far deeper than they imagined. Articles and speeches drafted in his own hand leave no doubt that Reagan was exceptionally well read and had an excellent grasp of both history and current issues, including highly technical matters and complex statistics. (13) This knowledge was honed by decades of reading the classics of conservative thought and having spent much of his life publicly debating those whose views were diametrically opposed to his. I was involved in one very small effort to get around Darman myself. One day early in the Reagan Administration, while I was still working on Capitol Hill, a midlevel White House staffer whom I knew called me. He had written a memo to the president that he couldn’t get through the bureaucracy. Knowing that Reagan was an avid reader of Human Events, the conservative weekly newspaper, my friend suggested that I take his memo, put my name on it, and publish it as an article in Human Events. I did, thereby getting the information and analysis to the president that my friend thought he needed. (17) Others in the White House frequently did the same thing by leaking memos to the Washington Post or the New York Times that appeared as news stories. By contrast, the Bush White House is obsessive about secrecy, viewing leaks of even the most mundane information as the equivalent of high treason. (18) Ironically, this attitude can be self-defeating, since “leaks” are a very effective way of getting one’s message out–as the Clinton White House often demonstrated. Think of it as giving an exclusive story to a reporter who has no choice but to accept the leaker’s “spin.” In this way, a leak can garner more and better press for a White House initiative than more conventional means like press releases. Leaking, in short, is not a moral issue, but can be a useful public relations technique. I was spared the purge only because Reagan had appointed Treasury Secretary Nicholas Brady in the last days of his administration, knowing that he was a close friend of then—Vice President Bush. Since Brady stayed on, that spared Treasury the “transition” that other departments underwent and thus avoided a purge. Within a year or so, most of the senior political appointees moved on anyway and Bush had his chance to appoint their successors. The same thing would have happened in all the other departments, too, thereby saving Bush a lot of unnecessary antagonism from the Reagan crowd. It would have helped Bush govern as well, since many of the purged positions remained vacant for some time for various reasons and were often filled with less competent and experienced replacements. Moreover, many of the so-called Bush people turned out to have no meaningful connection to him and were nothing more than friends of friends, serving in government just to get a line on their résumés and not because they had anything to accomplish in terms of policy. One of the first things I noticed when the new crowd came in in 1989 was that they would very seldom mention Ronald Reagan’s name. When necessary, they always referred to the “previous administration.” And it was quite clear that they viewed Reagan’s “hard-line” conservatism as passé and counterproductive to governing. They, on the other hand, thought themselves to be much more politically astute and believed that they would be far more effective by jettisoning Reagan’s ideological baggage. I was told by one of the key participants in this decision that they never intended it as a repudiation of the pledge, but merely as an acknowledgment that in a growing economy taxes automatically rise. (22) If this is true, it certainly is not evidence of political sophistication, but rather its opposite. Being the only Reaganite left in the Treasury Department, apparently I was the only one who knew how negatively Bush’s concession would be perceived by the Republican rank and file. (23) Unfortunately, no one asked my opinion before the decision was made.